10 million monthly users – Wetpaint Entertainment hit this milestone in March, only 18 months out of the gate. For a little context (and bragging rights): according to Quantcast, The Huffington Post took more than 3 years to build an audience that size. 1. Know deeply what our audience loves. 2. Give them the very best of it every moment of every day. Sounds simple, right? But executing on those principles took a ton of data and a great team. And a willingness to take the risk and bet that this paradigm shift toward digital and social is not only the best way to deliver on the formula above, but also the only way forward for media. While other publishers were looking at digital as a death sentence, we recognized it as a gift: an opportunity to know our audience far better than anyone ever before. So we took our secret formula (see above), along with our social media expertise, and built the best audience insights system on the planet. Our proprietary distribution technology did a lot of the heavy lifting, too. Once we knew what the audience wanted, we fed those insights into a distribution system that publishes straight to the newsfeed, and voila: 10 million users and social engagement that far outshines any other major media property. We couldn’t have done it without best-in-class content, of course. Knowing exactly what our audience wants helps our editorial team create and curate content that delights beyond audience expectations. We know what TV shows, celebrities, news events and themes resonate with our users. That content, delivered in the right way and at the right time, begets strong relationships: our 1.9 million Facebook fans see us 38 times per month (38! on average!) and look forward to Wetpaint posts in their newsfeeds. I knew we were onto something when we started building our platform around audience insights and social distribution, but the speed at which we’ve developed our audience has been surprising even to me. Congratulations to my team at Wetpaint on achieving every media company’s dream: outstanding content, strong engagement from a big audience, and technology that lets us do it all an order of magnitude better than anyone else. A number of people have asked me to share the math behind something I said last week: that social users are much more valuable than users from search. As some of you will recall, I was referring to the most powerful use of social: to build loyal audience relationships. It’s worth far more than a chance at a viral hit, a millionth fan, or even a social comment or like. That’s because the social networks are really “relationship platforms.” The currency of social networks is the data describing what users like. And with that data, anyone can serve an audience – and build a branded relationship with users – far better than a blue link in Google can do. 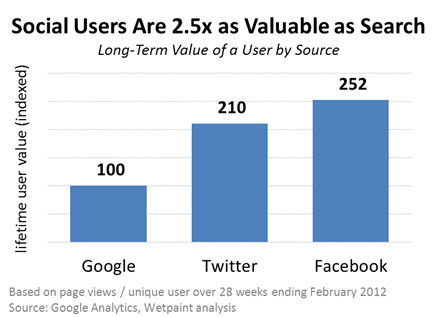 Users from social visit more often and stay longer. How much more often? Our Facebook users come 70% more often over the course of our dataset. And each time, they stay on average 50% longer – consuming more content, pageviews, and advertising. Put that together, and each Facebook user brings us 2.5x the revenue of a search user. And that’s without yet even adding in the value of engagement and viral referral to drive even more audience! First, social users are in a branded relationship. When your property shows up in a Facebook or Twitter feed, you can be identified with your logo and brand name. One better is when someone Likes or Follows you. When that happens, you’re now talking about the chance to build a relationship many times a day – with each and every post. From a brand building standpoint, this is nirvana – and it’s probably the most important reason why advertisers will spend billions of dollars to get into the social news feed this year. But even better for content publishers: if you do it right, you can get in for free. Second, the social relationship platform actually doubles as a data platform. It gives publishers real-time feedback data about what works, when. If you watch and measure carefully, you can tune the content, packaging and timing with real-time feedback so you can give the audience exactly what they want, when and how they want it. 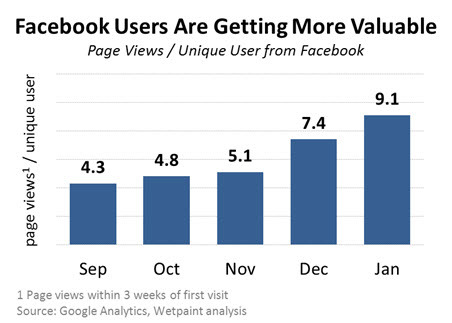 In January, the average user who came from Facebook looked at 9 pages – that’s more than double the number we were seeing just 5 months ago. I’m actually not surprised that not every publisher is seeing this kind of loyalty and engagement from social users. After all, it didn’t come without effort – I credit the dramatic increase in social user engagement in the chart above to our advanced technology helping the Wetpaint team understand and serve our audience. But that doesn’t mean that every publisher can’t get more loyalty from social users than they’re getting today. It just makes sense: social users should be more engaged and brand-loyal. They have a strong incentive to read and watch what their friends are talking about, to be included in the conversation. The only reason that many brands aren’t seeing the full value of social is that they’re blind to the opportunity of rich connections and data – and ultimately, they’re the ones who will be left out of the conversation. Is Social a Fad for Media? I feel like a lot of my posts lately have been beating the social drum, so I need to clarify my perspective. Social isn’t just a fad. It isn’t just a channel, or an alternate distribution medium. It’s actually turning into the new ether. As in “need it to breathe.” And while it’s not actually all about friends, it absolutely is about connecting to your audience. 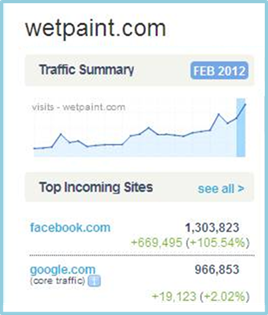 Case in point: according to Compete, in February Wetpaint Entertainment received more traffic from Facebook than from Google. Hey, I told you it was gonna happen. It’s because social has provided a medium for data and connection that lets us deeply relate to our audience. Increasingly, other publishers are finding the same – The Guardian most recently joined the club. The best part is that these gains in social aren’t coming at the expense of other channels – our overall traffic (including our search traffic) continues to climb. Social signals have a huge impact on search rankings, and so it makes sense that our social success would drive audience growth outside of social, too. For the last several years, many a publisher’s greatest fear has been that they’ll lose favor with Google. Afraid that any shift in strategy from SEO to social will lead to a precipitous fall from Google grace and a drop in traffic, they monitor the search rankings daily to see if the gods are pleased. But ironically, it turns out that an investment in social is the best SEO there is.